Okay, I’ve just discovered the first preorder bonus available, brace yourselves guys, it a…*drumroll*…commemorative coin!! Now let’s get this clear, I love Pokemon, I love shiny things, and I most certainly love money. So ordinarily this bonus would be right up my alley, if it weren’t so… well… random. 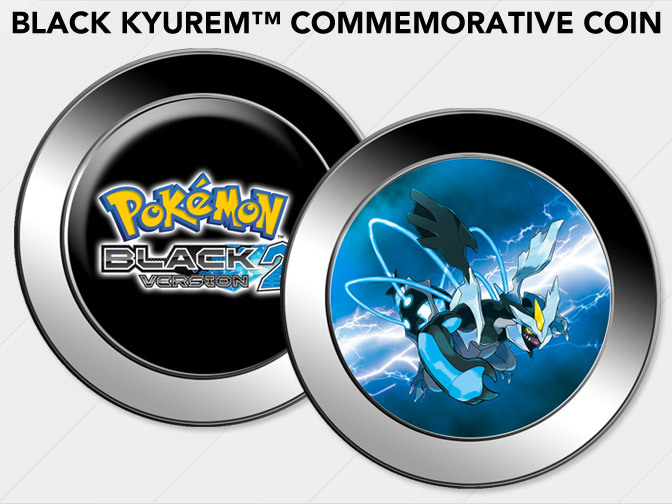 This glimmering tribute to Kyurem comes in an acrylic display case, free when you preorder Pokemon Black/White Version 2 – Kyurem Edition ($58) from EB Games. And no, before you can ask, the coin cannot be used as real money. There are two different designs, dependent on which version game you buy. Admittedly they do look pretty cool :3 Although it remains to be seen if they are actually made of metal or just plastic; the pictures make it hard to tell.